New APW Wyott Countertop Food Warmer. This energy efficient design keeps hot food at the perfect serving temperature. Made of heavy-duty stainless steel. Designed to run either with water (best option) or dry (will not harm warmer). Unique heat system evenly distributes heat. Insulated to protect interior parts and countertops from heat build up. Steel element support stabilizes heating element and reflects heat toward food. 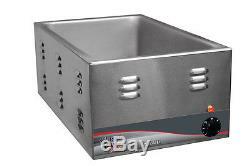 All Stainless steel well pan and housing for excellent durability. Superior element configuration provides even heat distribution. Heavy duty wiring extends element life. Provided with insulation to protect interior parts and countertops from heat build-up. 9 x 14-1/2 x 22-1/2. Electrical: 120V, 1200W, 10 amps. This item ships via UPS Ground. Visit our store for more great items! The item "NEW APW WYOTT Commercial Countertop Food Warmer W-3Vi" is in sale since Wednesday, December 15, 2010. This item is in the category "Business & Industrial\Restaurant & Food Service\Commercial Kitchen Equipment\Cooking & Warming Equipment\Soup & Steam Kettles". The seller is "choicechef" and is located in Harrisburg, Pennsylvania. This item can be shipped to United States.